In the crowded realm of high fantasy, N. K. Jemisin proves again that she can create a wholly new experience. Set in a world akin to ancient Egypt, but really much different, The Killing Moon tells the story of Ehiru, a holy death-bringer called a Gatherer who is devout and at peace until he finds that he’s actually moving closer to the center of a conspiracy that will cause a war. 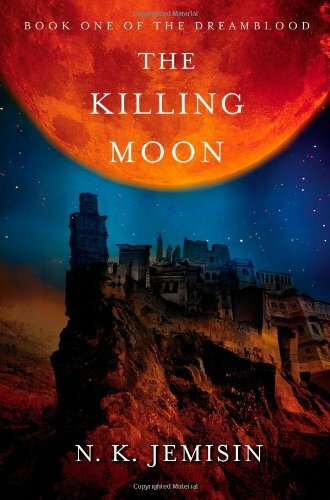 The Killing Moon is much shorter than the books in N. K. Jemisin’s previous series (The Broken Kingdoms series), but lacks nothing of the skilled storytelling, the evocative detail, the lyrical poetry, or the impressive imagination she’s known for. All the characters whose points of view we see through various parts of the story are distinct, with their own lives, histories, understandings, and goals. From Ehiru’s struggles with faith and truth, Nijiri’s path to adulthood, Sunandi’s attempts to save her country and uncover the terrible truths that threaten it, and the prince’s charm and ambition, author Jemisin weaves a strong, interesting plot, showing us a world that is equal parts beautiful and savage. The bigger story these characters reveal is complex and interesting, built on a mythology that’s unlike anything else, drawn from a generally underused corner of mythology. Ms. Jemisin manages to build a world that is both believably ancient and contemporary and clean—and she does this in half the space of her previous works’ worldbuilding. The reader can easily believe in a myth when the gods are painted so realistically and anthropomorphized, and the myths here are strange, beautiful, and unusual enough to retain the reader’s attention through the very last page. One of the most interesting parts is Ms. Jemisin’s signature atemporal structure; the story progresses from beginning to end, but there are mysterious interludes that both clarify and enrich the story as they unfold, interjections that result in adding an unexpected depth to The Killing Moon that could not have been achieved directly from a character’s sole POV. Added to this is a language that is musical and flowing, a poetic sensibility threading through the entire story, and a grasp of storytelling on a higher level than many of the books on the market today that informs the text with mythic proportions while keeping the action personal. Ms. Jemisin’s use of these prose flourishes elevate the text above the usual fare in this genre, making the story an addicting read. In an unusual move, the second book comes out one month after this first, and The Killing Moon does a fantastic job of creating a world readers will eagerly re-enter in the subsequent volume. N. K. Jemisin knows exactly what she’s doing as a fantasy writer.